Class Description: A traditional kaleidoscope takes a modern twist in this stunning medallion quilt. You’ll be blown away at how easy this quilt is to put together! Deonn will share her "Practically Perfect Paper-Piecing" tips for pretty points, great for beginners and seasoned quilters alike. 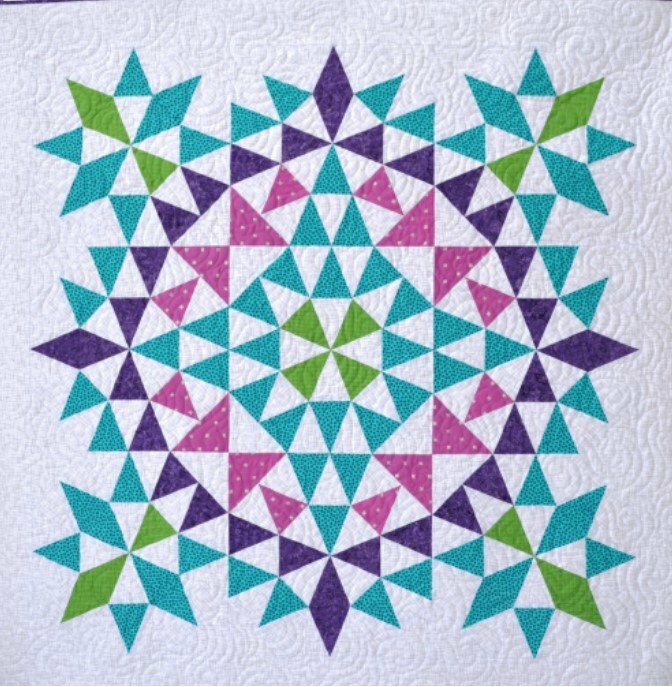 Class discussion will also include the use of rulers, templates and die-cut options to create this quilt, as well as playing with design possibilities (bring colored pencils to plot out your design). Then we'll wrap up with a "Paper-Piecing Perforation Party"! Quilt size: 53 x 53 (45 x 45 without border) Lap Quilt/Wall Hanging. Class Supply List: Machine, BSK including Glue Stick, matching or neutral thread. Tableside rotary cutting equipment, 12 inch Add-A-Quarter ruler (contact instructor to order ruler deonn@quiltscapesqs.com). Colored pencils or crayons to match your fabrics. For fabric selection, choose four of your favorite colors or tone-on-tone prints with a contrast background to suit your taste. Backing, 3 to 3-1/2 yards. Included In Kit. : All fabric for quilt as pictured, including border and binding fabric. Note: some substitutions may be necessary.